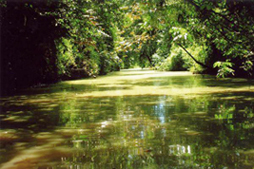 The Tortuguero Canals and the National Park are located on the Caribbean coast of Costa Rica. This destination is very famous around the world for being one of the most important locations for turtle nesting and conservation; species like the giant leatherback turtles, the green sea turtles and the hawksbill turtles come to Tortuguero every year between June and October. The Tortuguero National Park features 11 ecological habitats: from high rainforest to herbaceous marsh communities, a narrow lagoon connected to the sea, a beach, and an infinite maze of serpentine channels and streams fed by rivers flowing from the central mountain range and by the torrential rains that fall in the area. This area offers a wide variety of natural attractions and activities. Known as the Amazon of Costa Rica, the abundant flora and fauna at the National Park is very diverse and impressive. The destination of Tortuguero is only accessible by air or water. It is a tranquil place -there are no cars, no buses, no horns nor fumes, just the sound of the crashing waves, the birds, and the few people who live around a small village. In the village, travelers can find some quaint shops, hotels, restaurants and bars. Walking trough the forest, hiking on Cerro Tortuguero, swimming on the Caribbean Sea, or traveling in a canoe are some of the attractions that Tortuguero offers.